Ten days after 9/11, Rais was the victim of a horrific hate crime. Shot in the face at point blank range by white supremacist, Mark Stroman, Rais barely survived. Sadly, two others were killed. Stroman was sentenced to death; ten years later, Rais led an international campaign, fighting to save Stroman’s life. Rais Bhuiyan, an American Muslim, is an extraordinary individual with a powerful story. 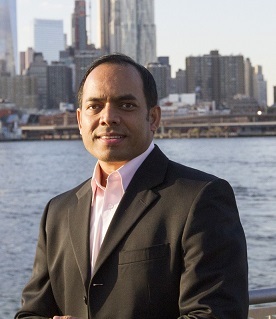 After serving as a pilot officer in the Bangladesh air force, Rais moved to the United States in 1999 to study computer technology. Ten days after 9/11, Rais was the victim of a horrific hate crime. Shot in the face at point blank range by white supremacist, Mark Stroman, Rais barely survived. Sadly, two others were killed. Stroman was sentenced to death; ten years later, Rais led an international campaign, fighting to save Stroman’s life. Rais’ near death experience and subsequent religious pilgrimage sparked a profound journey of soul searching and began his path as a human rights activist for peace, forgiveness, empathy and understanding. Rais’ effort to save Stroman from execution in 2011 was unsuccessful, but his ability to turn hate into compassion and forgive the unforgivable has been transformative. Through his non-profit, World Without Hate, Rais has touched the lives of more than 175,000 people as he shares his inspirational story and message at schools, universities, organizations and conferences all over the world. Rais’ efforts have been widely recognized, receiving the Excellence for Human Service Award, United for Change; Search for Common Ground Award, Search for Common Ground; 2011 American of the Year, Esquire Magazine; 2014 Human Relations Award, Muslim Public Affairs Council Foundation, among others. Rais is an IT specialist by day, but following his calling, working relentlessly to end the cycle of hate and violence. To create a better world for all, Rais believes in empathy, compassion and forgiveness. NY Times journalist Anand Giridharadas; the 2014 New York Times Book Review Notable Book and Publishers Weekly Best Book of the Year. During 2016, Rais worked with the Obama Administration’s Domestic Policy Council and State Department, receiving a personal letter from the President, thanking him for his courage and efforts. Rais is featured in the documentary series, The Secret Life of Muslims featured on Vox, PRI, and the USA network. His segment was chosen by CBS Sunday Morning for national broadcast on November 27, 2016. As a peace activist, human rights advocate and non-profit leader, Rais continues to travel globally, speaking about his experiences of forgiveness, compassion, empathy, understanding and acceptance, as well as hate-crimes, gun violence, victim’s rights, race relations, equity and social justice, workplace violence, intolerance, faith and leadership. Rais has recently become an official speaker with the State Department’s speaking bureau, beginning his work and travel supporting federal efforts for peace and understanding in early 2018. Hollywood’s feature film, based on The True American, is currently in production. So much good has come from Bhuiyan’s gesture of forgiveness, and still you wonder: How did he do it? He is blind in one eye. He still has three-dozen shotgun pellets in his face. There isn’t a day when he isn’t reminded of what Stroman did. Rais recounts his story as a survivor of a hate crime after 9/11. Listen to the way he decided to use compassion and forgiveness to transform his life and the life of the man who carried out the crime.